Israel is a country made up of contradictions. A lively democracy in a multicultural society but within a state promoting a strong national identity; a thriving economy in an unequal society; a culture open to modern trends but drawing on the Hebrew past and preoccupied with the Holocaust and the Arab-Israeli conflict; a sovereign member in the international arena, whose existence is still contested in the Middle East. 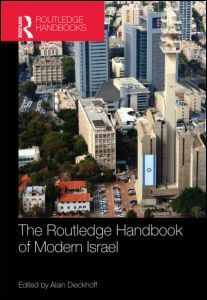 The Routledge Handbook of Modern Israelprovides a comprehensive profile of the intricacies of contemporary Israel, offering a unique, in-depth survey of the country. Bringing together more than thirty notable contributors from across the globe, this Handbooksheds light on the multifaceted reality of modern Israel in order to better understand, beyond clichés, this complex society. Alain Dieckhoff is senior CNRS.research fellow at CERI. His research area focuses on politics, contemporary society and transformations of the state in Israel. He also works on the transformations of contemporary nationalism. Alain Dieckhoff is Head of the Political Science Department of Sciences Po. See his publications.